Matrix-inclusion composites are known to exhibit interaction among the inclusions. When it comes to the special case of inclusions in form of flat interfaces, interaction among interfaces would be clearly expected, but the two-dimensional nature of interfaces implies quite surprising interaction properties. This is the motivation to analyze how interaction among two different classes of microscopic interfaces manifests itself in macroscopic creep and relaxation functions of matrix-interface composites. To this end, we analyze composites made of a linear elastic solid matrix hosting parallel interfaces, and we consider that creep and relaxation of such composites result from micro-sliding within adsorbed fluid layers filling the interfaces. The latter idea was recently elaborated in the framework of continuum micromechanics, exploiting eigenstress homogenization schemes, see Shahidi et al. (Eur J Mech A Solids 45:41–58, 2014). After a rather simple mathematical exercise, it becomes obvious that creep functions do not reflect any interface interaction. Mathematical derivation of relaxation functions, however, turns out to be much more challenging because of pronounced interface interaction. Based on a careful selection of solution methods, including Laplace transforms and the method of non-dimensionalization, we analytically derive a closed-form expression of the relaxation functions, which provides the sought insight into interface interaction. 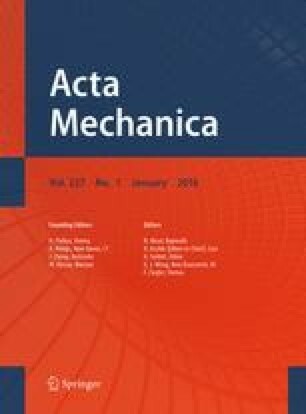 The seeming paradox that no interface interaction can be identified from creep functions, while interface interaction manifests itself very clearly in the relaxation functions of matrix-interface materials, is finally resolved based on stress and strain average rules for interfaced composites. They clarify that uniform stress boundary conditions lead to a direct external control of average stress and strain states in the solid matrix, and this prevents interaction among interfaces. Under uniform strain boundary conditions, in turn, interfacial dislocations do influence the average stress and strain states in the solid matrix, and this results in pronounced interface interaction.